1 What is Action Learning? All of the courses we offer now are Action Learning Courses: from the very first day we support you in developing YOUR designs - the projects in your life, providing you with the best of the theory (a summary of everything we've collectively learned so far, from much experience) in order to enable you to do so in the most intelligent, sustainable & effective way possible. We save a lot of money & energy supporting you wherever you can have most impact as an agent of change: in your home, your project, your neighborhood, etc. & for this reason also we can provide such economical courses of such high quality content. It is the fundamental concept that governs how we teach. It is the most direct way to learn to create PermaCulture, & the method is based in the work of many radical educators whom we have now compiled in our online Designers Manual > Learning. Action learning is a more rigorous & supported form of self-directed learning: you aren't alone in this process, it is done accompanied by a small community with this purpose, that includes very experienced tutors & activists, learning to give & receive good support, & to keep to the very high levels of integrity that are required of this science, that is so important that we don't allow to dilute right now. We could say that 'the university of life', in the same way as the design cycle, and of the learning cycle, has an ascending spiral shape - we need to actively do the work of each stage of the cycle in order to move up to the following level of learning, understanding & wisdom. Native peoples (the only human cultures that approximate to living in a sustainable way, & all are - or were - ongoing experiments) are perfectly connected to their physical surroundings because they are cultures based on action-learning, which is diametrically opposed to the disconnected emphasis which characterizes our educational system. Part our logo represents the spiral motif which is found in so many aboriginal art forms all over the planet - & represents, on one hand our respect for peoples & cultures native to our own bioregions, & on the other, the global connection between all sustainable cultures. These native cultures were also based in "harvesting only sunshine" (solar energy - a fundamental base & permacultural saying), that is, in the art of sustainability, or of "using what there is", within natural limits, working with a profound knowledge of the environment & the specific local conditions, without fighting against the laws of nature, but applying a commitment to studying them and living in a relationship of with gratitude & respect towards them, and the immense richness they offer us. Action Learning is basically our natural way of learning & relating to our environment - when children do it, we call it 'playing'. It includes a lot of fun & laughter, as well as very serious moments, some painful times, some exciting periods & also meditative & preoccupied times. & lots of experimentation. It consists in keeping a clear interest focus (the centre of the spiral) & taking each of the little steps that need to be taken in order to put into practice these ideals (the harmonic sequence of rainbow colours/ rays), so learning in a deep way, 'for real'. All a cyclical processes, & if we understand the natural patterns that govern them, & something of their periodicity, we could use them with much greater effectiveness. 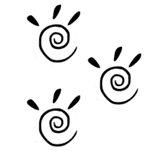 The classes that are offered in the programme of each course only pretend to accompany one in one of the basic cycles of learning in PermaCulture: the 'black paw' that you can see inside the logo is to remind us that the little steps, in order to move forward the theory & continue with a real action-learning, have to be done by YOU. But we do all that we can in order to support you in this journey, encouraging support groups & continuous contact during (& also after, if you wish) the curse with the other participants, as well as the tutors. Action learning is characterized by active & mutual support (we also teach the tools to learn to do this in a more effective way). Possibly the most difficult thing about Action Learning is to re-learn to 'do' with our own hands, think & act logically but at the same time honoring our feelings, using our imagination all the while; letting ourselves learn with our whole body, & launching ourselves into adventure by trying totally new things. This can be very uncomfortable for the majority of us, as comfort-seeking is possibly the strongest pattern in the Destructo-Culture - & the one that most enslaves us. There are others. The grayest or most painful parts are often also the greatest learning opportunities. You have the opportunity of doing (& support others in doing) a radical learning experience: you choose in every moment how much you want to do & when, but you will be able to overcome the greatest challenges with the support & closeness of your colleagues & travel partners. All that is taught during a Certificate course can be put into practice immediately in your life, in any circumstance that you find yourself (with or without access to land, with or without own home, with or without money or material resources, etc.). & it only works if it's put into practice. So the practicals consist in making reality in our daily life what we learn on the course. We will do some exercises during the course in order to practice some of the techniques & tools, but the main practice that we do during the Certificate courses is design practice (as it is a design course). one on a group project - & there are many we are already doing that we can invite you in, if you don't have a local one. los cursos on-line* nos dan mucho mejores resultados de los viejos cursos residenciales (de 15-20 días) en términos de estudiantes que llegan a entender como realmente aplicar las poderosas herramientas de la PermaCultura a su mundo real. * Gracias a las múltiples herramientas modernas de comunicación, muy fáciles a usar y que no existían hace unos pocos años. Entonces los estudiantes no se quedan simplemente entusiasmados por la amplia y detallada teoría de la permacultura pero con poca idea o recursos (especialmente acompañamiento por personas con mucha experiencia) para aplicarla a sus propios proyectos, y llevarlos a término con constancia hasta el éxito. Esto es porqué podemos personalizar al máximo el curso para cada persona, poniendo al centro de su aprendizaje los proyectos y diseños reales y concretos que está realizando, empezando o pensando. Además cada estudiante puede ver los proyectos en marcha de todos los demás compañeros, y también seguir su aprendizaje en acción. Entonces podemos hacer conexiones y referencias desde esas múltiples ramas de práctica vital, dinámica y muy concreta >>> a la teoría (en vez de dar solamente ejemplos de proyectos y diseños ya completos de otros). Además podemos extender las clases teóricas con el tiempo de los cursos - visto que no tenemos que aprovechar el tiempo y dinero invertidos en viajes y alojamientos - y por eso también los cursos cuestan mucho menos de los cursos residenciales que solíamos hacer. Tenemos mucho más tiempo para atender a cada estudiante de forma individual, y así conocer bien sus circunstancias de vida para poder ayudarles diseñar sus proyectos. Estos a menudo son decisiones de vida importantes como transiciones a nuevos estilos de vida, poner en marcha eco-empresas, llevar proyectos de transición, organizar su grupo de apoyo o comunidad, llevar su finca o huerto, etc. Cada estudiante empieza desde el primer día a desarrollar su propio cuaderno de diseños personal, que es como antiguamente solo se hacía el proceso hacia el diploma de permacultura aplicada. Ahora esta poderosa forma de aprender directamente desde la práctica, acompañados íntimamente en cada paso por profesionales expertos y un gran grupo de compañeros en similares circunstancias, está al alcance de tod@s.
y físicas que se pueden aplicar enseguida. un esquema con el cual uno vuelve a casa. a apreciar la permacultura añadiendo a ella. el llevar la teoría a la práctica. La práctica informa a la teoría.